How to Customize the VirtueMart Home Page (Shop Page). How to provide a more interesting VirtueMart Front Page. If you make a link just to the VirtueMart component as many do as a Front Page to their shop you get a rather boring list of top level categories and/or category thumbnails. It can be made a lot more interesting and helpful to your visitor. To achieve it there is a large amount of coding needed of quite a few different files but the result is well worth it. If you would like to have your VirtueMart Home page styled like this or in some other way just contact us through our Contact Page. We can also code your VirtueMart site so that these different search dialogues are always displayed above the search results. 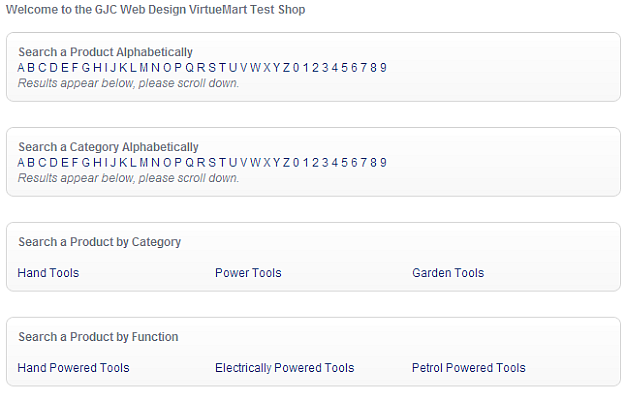 You can see examples of this in action on our test shop at Our VirtueMart Test Shop and also as an image below.